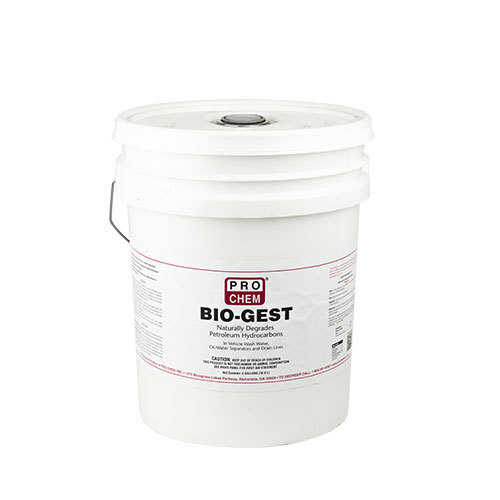 Bio-Gest | Pro Chem, Inc.
BIO-GEST is a bacterial inoculant for use in degrading oils, greases and other stubborn organics. It is useful in treating oil/water separators and other collection systems such as the ones used in the treatment of waste from the cleaning of service bays in automotive maintenance shops. BIO-GEST can reduce chemical oxygen demand (COD) by as much as 95% and can reduce oil and grease (Total Petroleum Hydrocarbons) by 75%, which should result in reducing the need for pumping by up to 80%. Initial Dosage: Add 5 gallons of BIO-GEST directly into the oil/water separator or to a drain discharging to the separator. Maintenance Dose: Add 12 ounces per day. *Amount can vary depending on the size of the oil/water separator and its operating conditions. The preferable method of addition is with one of our PRO PUMPS.